Sloths in Costa Rica are like the beauty everyone wants to dance with. None can get enough of them. Visitors from all over the World come to see them and stand in awe in front of this fantastic, rather slow and quite filthy creature. What is it about them? Like the Mona Lisa, probably it is the smile, maybe without the wit of the latter but with a softness that is hard to ignore. There is a wise aura around the sloths and somehow we, humans are attracted to it. The fact is that sloths in Costa Rica are the most popular and supported animal. And of course, another fact is that if you are coming, or are already in Costa Rica, you want to see a sloth. Sloths are neotropical* mammals that live up the treetops as their diet is based on leaves. There are two families of sloths in the World: Two-Toed Sloths and Three-Toed Sloths. And these have six species, among the ones you will find two in Costa Rica. They’ve been about for millions of years – 64 million, to be precise. We all know Sid from Ice Age, which is our nowadays version of the great grandad of all the sloths we know today, in all their different adaptations. 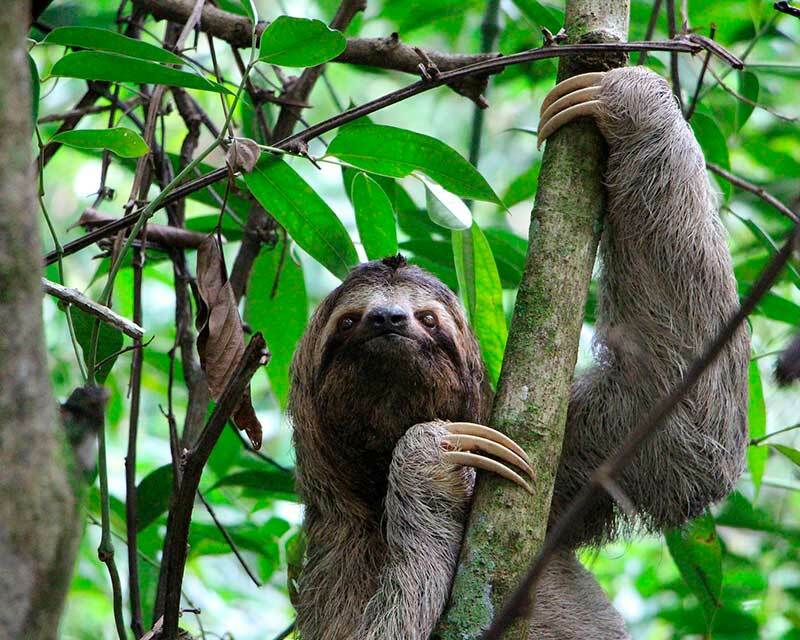 In Costa Rica, we have the Brown-throated three-toed sloth and the Hoffman’s two-toed sloth. The Hoffman’s Two-toed Sloth harder to find as it is usually active during the night. Throughout the day, you will see it curled in a furball usually covered by leaves. The most known three-toed sloth in the world is the diurnal Brown-throated sloth. They are smaller in size than Hoffman’s sloth as they are a bit more active. Sloths slowness is key to their survival. 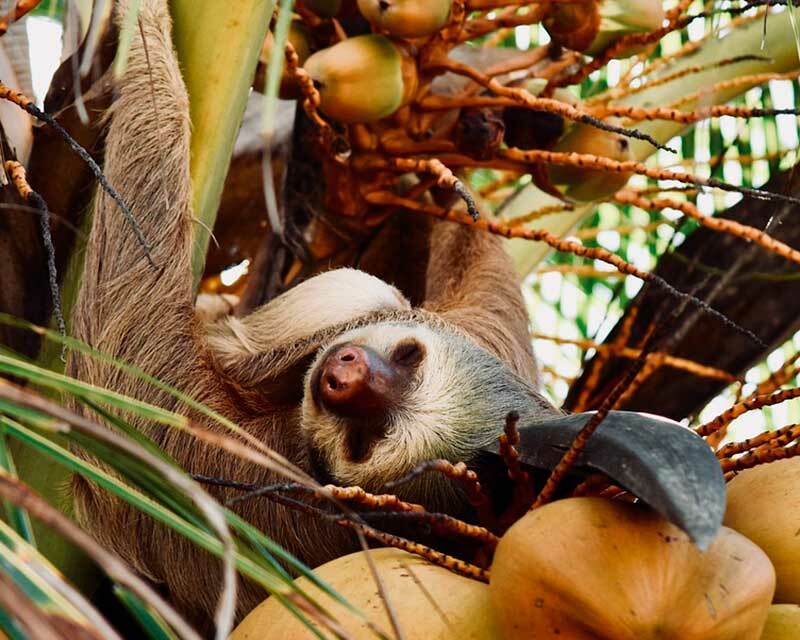 Far from being lazy and disregarding their Spanish name (Perezosos) sloths are very efficient at maintaining energy, and it has to do with their diet. Sloths are sluggish because of what they eat: twigs, leaves, and flowers and are low in energy and lacks much of the nutrients required — like fats and protein — for a well-balanced meal. However, this feature also helps them survive in the forest, especially for situations like droughts or other nature situations. Usually, herbivores that eat tree leaves, twigs and flowers have to have very complex digestive systems that will allow them to take the cellulose among other substances. In the case of the sloth, although it does have a complex digestive system, they compensate their small size with a great energy saving system and a regulation of their temperature (Like reptiles, yes). The first descriptions in the 1700’s of the sloths described it as a lazy and useless animal. In the past few years, the image makeover has succeeded and turns out that they are the sweetest and most charming creature of the jungle. Both are wrong. And we will be able to see some of the facts that gave both impressions. Sloths are one of the most adaptative creatures in the rainforest. Biologists consider that sloths make up more than half the entire biomass of rainforests in South and Central America. Nevermind how cute they look! You do not want to hug a sloth! Sloth hair is long and rough and depending on the species can include either some channels or irregular transverse fissures that grow in number and size with the age of the sloth. These peculiarities are ideal for inhabitation by a wide diversity of organisms, ranging from cockroaches, moths, and beetles, to ciliates, fungi, and algae. Sloth’s hair actually works as an ecological association holding swarms of moths and algae. Helping sloths hide in the green forests the algae serve as well as a food source even for the sloth itself, and it seems they are fertilized by the sloths own feces. Sloths have little reason to move out of the safety of the rainforest canopy, but once a week they sink to the bottom of their preferred tree to defecate. The exact cause for this perilous journey is still a mystery, but researchers speculate that it may help sustain the algae fields in their hair. Sloths turn their heads up to 270°. This is quite helpful as their main predator are the harpy eagles. 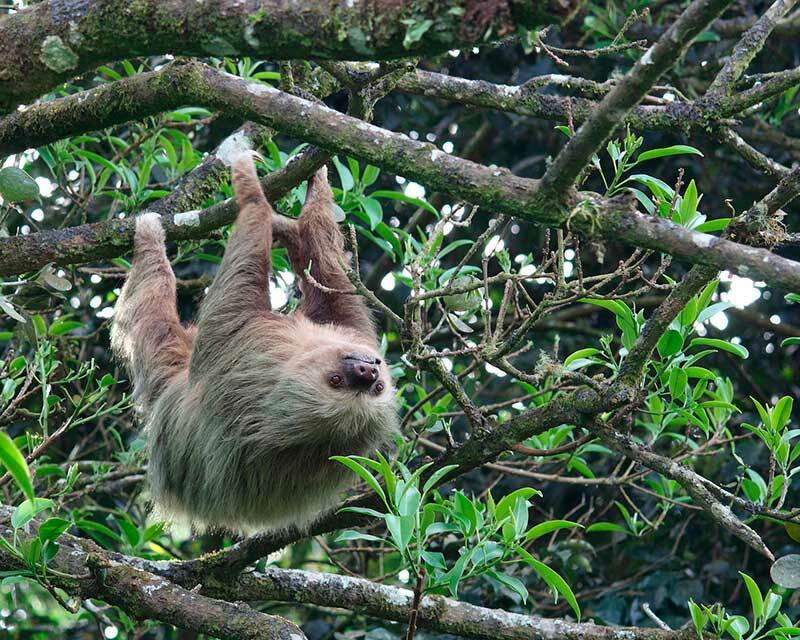 Providing wild sloths with packs that track their actions, it was discovered that sloths consume almost all of their time upside down. 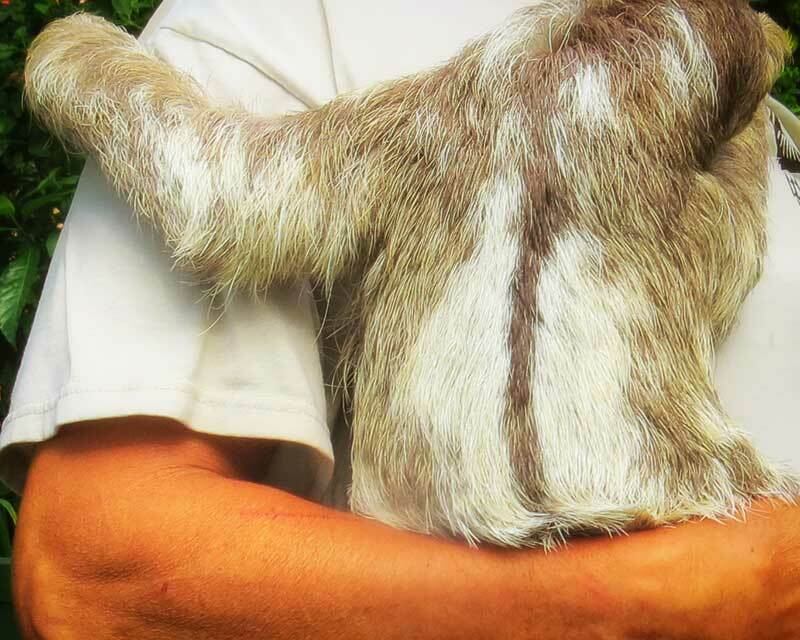 To manage the influence of gravity, sloths have developed unique fibrous adhesions that keep their organs from turning. Reading point 2, we see that sloths may not sound very appealing. However large birds of prey (Especially harpy eagles) and cats will eat them if they get the chance. It is quite interesting to think what makes them successful as they are as slow and defenseless. Despite their lethargy, sloths can be remarkably resilient to predators. Their claws are like fast knives when they feel attacked, but they have developed the mightiest of all superpowers: Invisibility. Their algae, and all that inhabits in their fur, together with their slow movements make them genuinely invisible. They may be sluggish in the trees, but sloths can go up to three times quicker in the water. You can see them in Tortuguero, sometimes crossing the canals. Without any exaggeration, it can take up to 30 days for a sloth to digest one single leaf. Although their average is 16 days. Just 10 species of mammals — less than 0.2%— have evolved to eat leaves and fruit that can only be obtained by ascending to the treetops. Leaves are very tough to digest, and usually, it is big animals that have this exclusive diet (Elephants or Giraffes) as they have the space for the complex system that can digest cellulose. In the case of the sloth, other than a complex stomach (That they do have), they do save a lot of energy by just not moving much and regulating their temperature according to the environment (Like reptiles) (Three-toed sloths’ metabolism is 31% slower than two-toed sloths). Scientists took units of fungus from sloth hairs and found that some were skilled for fighting parasites, bacteria and even breast cancer cells. Though confined sloths have been known to sleep 15 to 20 hours a day, free sloths will usually only snooze for 10 hours. They live in the trees. Any tree, by the roads and in National Parks. 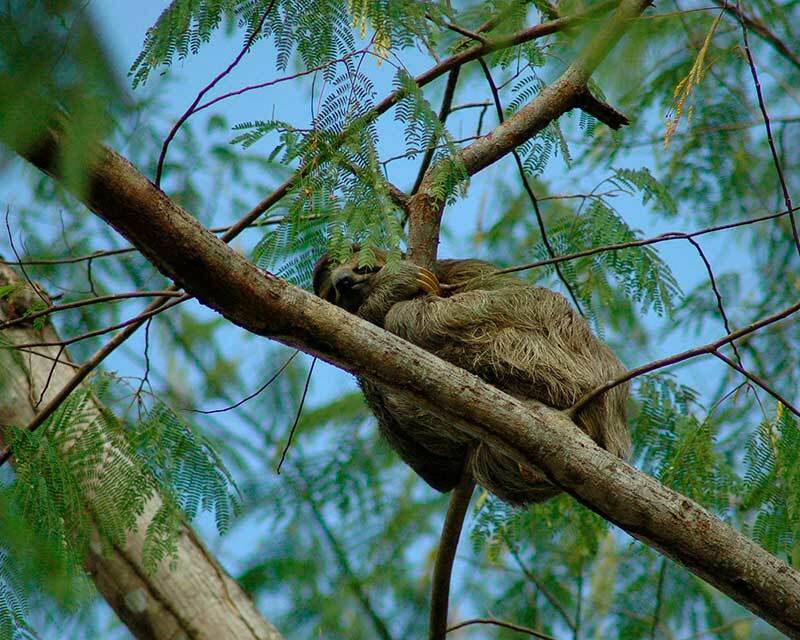 Up until the 1960’s, sloths were living in the old trees that existed in the Central Park of San Jose. With their long nails and bulky muscles, sloths have a compelling grip. Their bodies are so adapted to dangling from trees that dead sloths have been discovered still hung from the branch they were climbing on. Now, that is the critical question… Isn’t it? 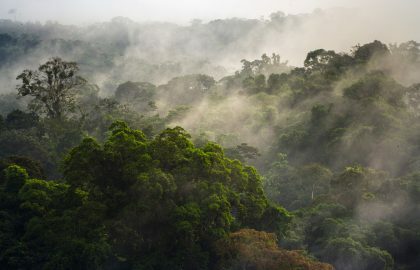 Of course, we can make it easy saying “in the rainforest.” However, no. 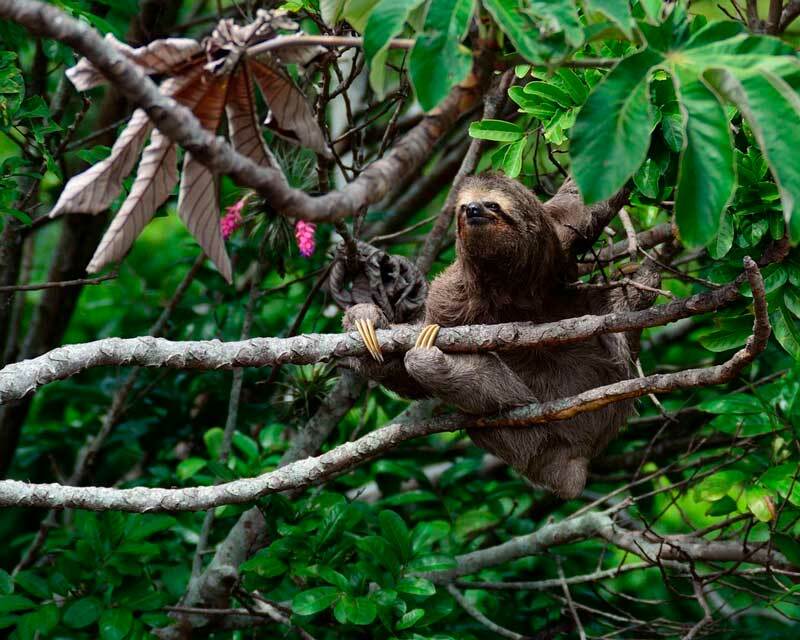 Sloths are hard to spot on a trail in a dense rainforest (Unless they are down in the WC). Remember that in the jungle survival is the primary objective of any living creature, and hiding is part of surviving. Any tour guide of Costa Rica will tell you definitely that the best places to see a sloth is actually the road. Yes, the road. The roads in Costa Rica are usually fenced by trees, and some of the most common are the cecropia trees. You can spot a sloth from a distance if it is on a cecropia tree. And mainly because the cecropia tree allows the visibility because of its shape. The Cecropia tree has big leaves and very long limbs that have no vegetation whatsoever. However, this is a question mark, you may see them… Or you may not. And, on the other hand nowadays, and because of accident risks, you may see them from your bus window… And that’s it! 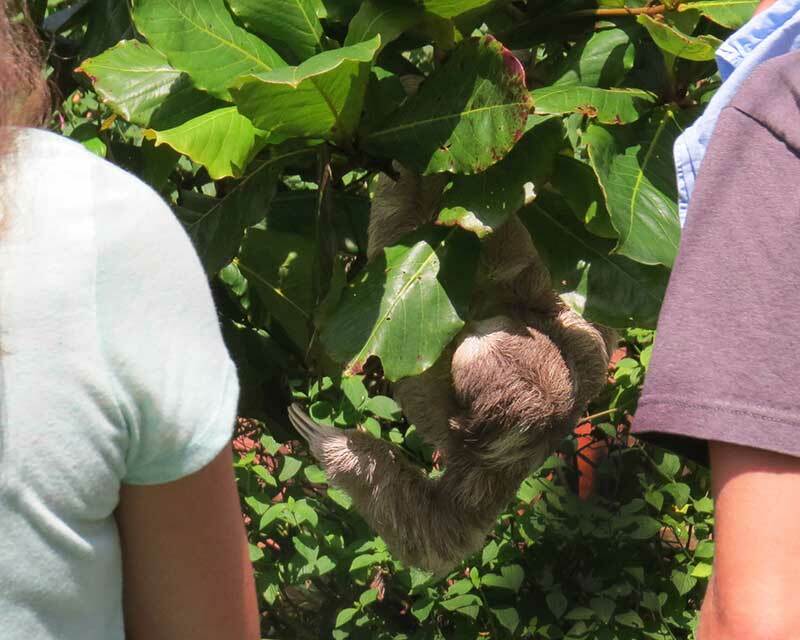 Probably the best way to see them, if you are a fan, is to go for a true sloth tour. Sloth tours are based on these fantastic creatures. The tour guides are absolute experts on the subject, and the companies that offer this tour actually give 100% visibility guarantee. In some rescue centers, sloths are in cages as they have been rescued from different accidents or situations. However, in some cases (Must say that these are exceptions to the beautiful rule of people worried about their welfare) the rescue centers are turned into covered zoos and sloths are merely caged, for no reason. Will you see their habits in the wilderness? 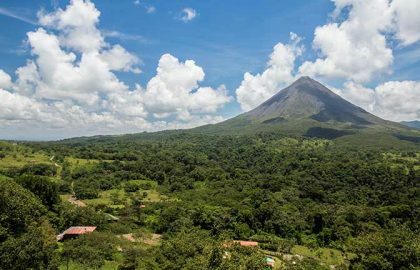 If you really want to see a sloth in all its splendor go for the Sloth Tour that Ecoterra offers in the region of Arenal. There, you will be able to see the sloths in their natural habitat and in their usual daily life, hanging upside down, catching some leaves, and slowly scratching some of their fur ecosystems. Beware of places where you get to hold a sloth or feed it unless you are part of the specialized staff in a rescue center (Volunteers that have been trained to work with the vets, for instance). There is no excuse or justification for a sloth to be in the hands of tourists. We use creams, repellent, perfume and other substances (Including our sweat) that can harm them. Sloths are cute and exciting, but they are wildlife, and we must not forget that. They are not meant to be pets, nor to be caressed by loving humans. It is virtually impossible not to see sloths in Costa Rica if you come to look at the rainforest and they are not that far away from the cities either, but please, as in everything that has to do with nature, let’s observe them and awe at them responsibly and without any harm. Pictures by Olga Sáenz Carbonell – All rights reserved.